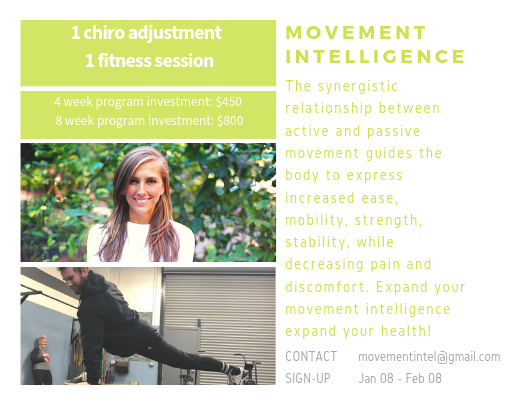 Move into the new year with movement intelligence! If you didn’t catch it on the gram (instagram), I am teaming up with our dedicated nooner and chiropractor, Alandi. We are teaming up to integrate both passive and active movement practices to maximize your improvement, all at a great price. We are offering people the chance to have one chiropractic adjustment, and one personal training session a week, for either four, or eight weeks. If you’re looking to re-claim your movement, or want to improve existing movement by way of increased mobility, stability, balance, and strength, come see what personal training paired with chiropractic can do for you. If you think you may know of someone who could benefit from some chiro and personal training, let them know! You can send them over any of the instagram post myself, the sweat shop, or Alandi have made, or just send them a text and let them know! There will be a stack of flyers at the gym if you want to take one for some more info, or to give to someone. If any of you have any more questions feel free to ask me at the gym. If you’re ready to sign up you can e-mail movementintel@gmail.com. Awesome idea DJ and Alandi! The two of you are great at what you do, and I think to have both of you collaborating and communicating amongst each other on someone’s movement is a benefit that not many others can offer!